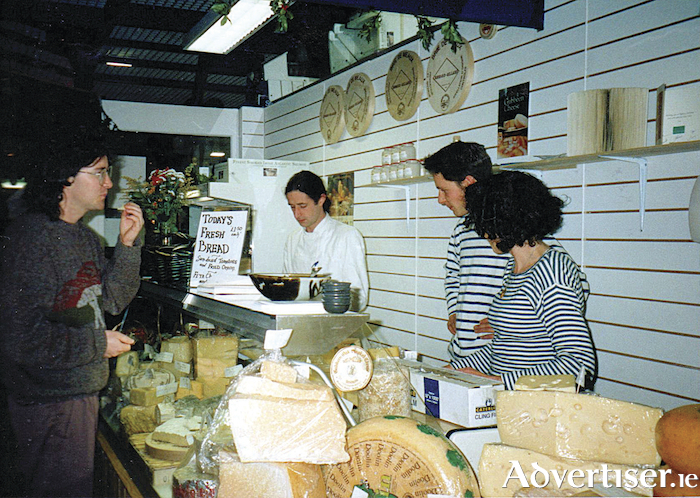 Theres no doubt that it has been an incredible journey for our own Sheridans Cheesemongers. After starting out selling Irish farmhouse cheese on a market stall in Galway almost 25 years ago, the Sheridan brothers' operation has grown, and Sheridans Cheesemongers can now be found in shops in Galway, Dublin, Waterford, and Meath. Their ethos is about providing quality farmhouse cheese to customers and they have always been enthusiastic supporters of raw milk cheese, quality producers, and the traditions of Irish food. Sheridans as we know it, of course, is located just opposite the lovely St Nicholas’s Church in the centre of the city where the famous Galway market is held every Saturday. It is not all about cheese, there are also chutneys, cured meats, olives, and lots of other delectable goodies to fill your basket with. Up a narrow flight of stairs is its wonderful wine bar, a social hub for the market traders and where you will invariably find many of the chefs of the city on their days off. A visit to Sheridans is a relaxed, convivial, affair. Shelves of wines are all are imported and selected exclusively for Sheridans, along with some excellent wines from small producers in France, Spain, and Portugal. You can buy a bottle to take home with you too. Diverse and delicious cheese and charcuterie boards are chosen daily from their wide selection in the deli below, a great way to try before you buy. All boards are served, of course, with their own brown bread crackers and chutney. A seat overlooking the hustle and bustle of the market on a Saturday with a nibble and a tipple in hand is always a pleasure. Then there is the annual Irish food festival, started by Sheridans in 2010 and supported by the company. This is a true celebration of Irish food, with an emphasis on quality, a day for Ireland’s top food producers to sell, sample, and talk about their produce and to celebrate Irish food traditions. The festival, held at the company's Virginia Road Station headquarters in Co Meath, is family friendly and really has something for everyone. If that wasn't enough, the brothers have also found time to make a contribution to literature — Counter Culture - Sheridan's guide to cheese, an indispensable handbook for both novice cheeselovers and mature connoisseurs. In this, their first book, Kevin and Seamus share their expert knowledge and invite you on a journey through the vast array of cheeses that adorn their shelves. The Sheridans’ Guide to Cheese is a complete guide to the cheeses of the world, featuring tasting notes, wine and flavour pairings, and recipes to help you appreciate every cheese you try. The latest accolade for Sheridans Cheesemongers is being named the Guild of Fine Food Shop of the Year for its shop at Dunnes Stores Cornelscourt, the first win for an Irish cheese shop in the competition. The Guild of Fine Food’s annual Shop of the Year is the most prestigious award given to independent retailers in the UK and Ireland. The award recognises pre-eminent independent food retailers in six categories, one of which is specialist cheese shop. Sheridans Cheesemongers first partnered with Dunnes Store in 2015 to create a cheese counter for its Stephen's Green location. Since then, the collaboration has developed to include nine locations across Dunnes Stores, all providing farmhouse, artisan cheeses from Ireland and Europe. Dunnes customers are offered a knowledgeable cheesemonger experience and a huge cheese selection from the convenience of their local store, a far cry from your standard inanimate supermarket refrigerator. Instead, you are greeted by passionate and educated cheesemongers standing in front of an array of cheeses, ready to slice a taste of whatever interests you. Dunnes customers are offered a range of cheeses that they would not normally have access to, and the opportunity to try something new. A potentially risky union between independent retailer and mainstream supermarket? Possibly so, but the model works as customers keep going back looking for more and more cheese. Kevin Sheridan said of the honour: "I am so delighted with this award, it is a wonderful endorsement for our fantastic team, our wonderful cheesemakers, and the vision of Dunnes Stores which has allowed us to bring great Irish cheese to more and more customers." Sheridans is certainly a Galway icon whose passion for the democratisation of specialty food has seen them grow from strength to strength. The boys did good. Sheridans Wine Shop and Bar, Church Yard Street, Galway. Tel: 091 564 832.